RHODES, John Jacob, (father of John Jacob Rhodes III), a Representative from Arizona; born in Council Grove, Morris County, Kans., September 18, 1916; attended the public schools; graduated from Kansas State University, Manhattan, Kans., 1938; graduated from Harvard Law School, Cambridge, Mass., 1941; lawyer, private practice; United States Army Air Corps, 1941-1946; staff judge advocate of Arizona National Guard, 1947-1952; vice chairman, Arizona Board of Public Welfare, 1951-1952; delegate, Republican National Conventions, 1952, 1964, and 1968; elected as a Republican to the Eighty-third and to the fourteen succeeding Congresses (January 3, 1953-January 3, 1983); minority leader (Ninety-third through Ninety-sixth Congresses); was not a candidate for reelection in 1982; died on August 24, 2003, in Mesa, Ariz.
Papers: 1952-1983, 338.5 feet. The collection includes correspondence, reports, financial and travel records, and printed matter documenting John J. Rhodes's congressional career. Subjects covered by the collection include the Central Arizona Project, Indians, water legislation, campaign activities, and the Barry Goldwater presidential campaign. An unpublished register is available in the repository. Papers: In the John J. Rhodes minority leader papers, 1968-1980, 99 feet. The papers consist of correspondence, legislation, speeches, press releases, and financial records covering the Republican political leadership in the U.S. House of Representatives. A guide to the papers is available in the repository. Papers: In the John J. Rhodes and Howard H. Baker, Jr. joint leadership papers, 1971-1980, 6.5 feet. These papers include press releases, issue files, newsclippings, and voting record analyses documenting John J. Rhodes's service as House minority leader and Howard Baker's service as Senate minority leader. A guide to the papers is available in the repository. Papers: In the John J. Rhodes press office files, 1973-1983, 26.5 feet. The files include correspondence, press releases, congressional testimony, television and radio show transcripts, newsclippings, record statements, administrative records and publications. Subjects covered in the files include taxation, Watergate, foreign affairs including the Iranian hostage crisis, water resources development, Central Arizona Project, health care, and energy issues. Papers: In the Central Arizona Project Association Records, 1922-1974, 28.5 linear feet. Persons represented include John J. Rhodes. A finding aid is available in the repository. Papers: In the Pat Fullinwider Papers, 1970-1976, 16.9 linear feet. Correspondence, mailing lists, computer printouts, financial records, printed matter, and clippings, chiefly relating to Pat Fullinwider's unsuccessful attempts to unseat U.S. Representative John Rhodes in 1974 and 1976. Papers: In the Carl Bert Albert Papers, 1910-1976, 1,000 cubic feet. Other authors include John J. Rhodes. A folder level inventory is available in the repository. Videoreel, Videocassettes, and Sound Tape Reel: 1974-1988, 5 commercials on 1 videoreel, 10 commercials on 3 videocassettes, and 3 commercials on 1 sound tape reel. 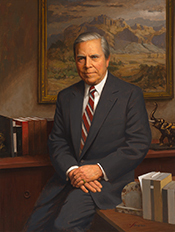 The commercials were used during John J. Rhodes's campaigns for the 1974, 1980, and 1982 U.S. congressional elections in District 1 and the 1988 gubernatorial election in Arizona, Republican Party. Ralph Nader Congress Project. Citizens Look at Congress: John J. Rhodes, Republican Representative from Arizona. Washington, D. C.: Grossman Publishers, 1972. Rhodes, John J. "Floor Procedures in the House of Representatives." In We Propose: A Modern Congress, edited by Mary McInnis, pp. 201-13. New York: McGraw-Hill, 1966. ___. The Futile System: How to Unchain Congress and Make the System Work Again. Garden City, N.Y.: Doubleday, 1976. ___., with Dean Smith. I Was There. Salt Lake City, UT: Northwest Publishing, 1995. Smith, J. Brian. John J. Rhodes: Man of the House. Phoenix, Ariz.: Primer Publishers, 2005.